Known to be present, common and easy to photograph. Not known to be present or difficult to photograph, but common and should be around if you know what or where to look for. Known to be present, but uncommon or rare. Not known to be present or was historically present and uncommon or rare now. Myths and legends, either believed to be present and most likely not, or vice versa. The Woodland Dormouse was on my "Good bets" list: They should be fairly common in the forests and thickets, but might be tricky to photograph and identify. When I first got to this location I had a Cuddeback with me. Since I wasn't in the mood for mice, but instead had Blue Duiker on my mind I decided to strap the camera around the tree and point it towards the clearing. In the end I only photographed a couple of Bushbuck. (I've posted some of the pictures before over here, see the 3rd and 4th photographs.) 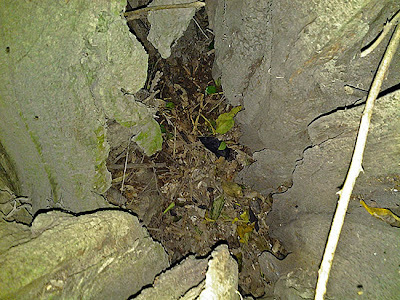 When I went to collect the camera I noticed a big hole on the other side of the tree. It looked promising and since I had a Bushnell with me, which is much better at photographing small critters than a Cuddeback, I decided to strap it to an adjacent tree and see whether anything uses the hole or climbs up and down the tree. I wasn't disappointed. 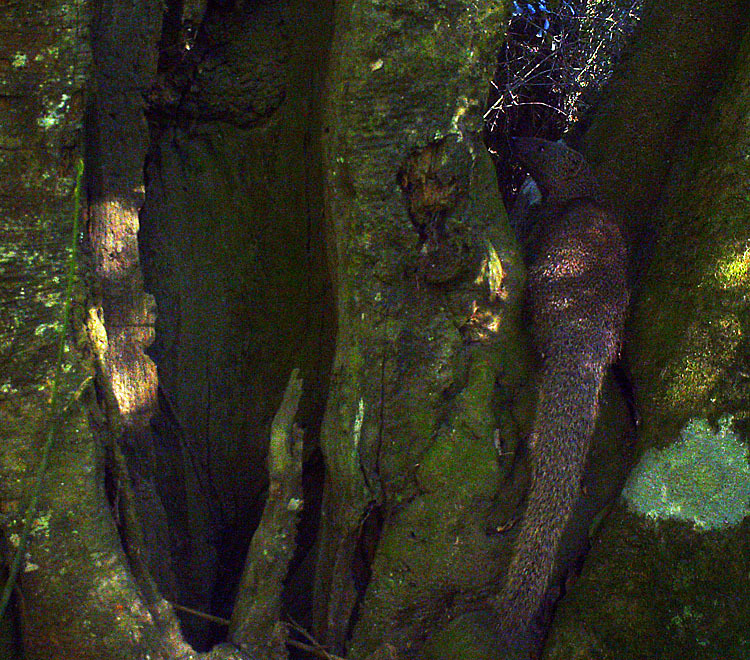 The tree was crawling with Dormice! 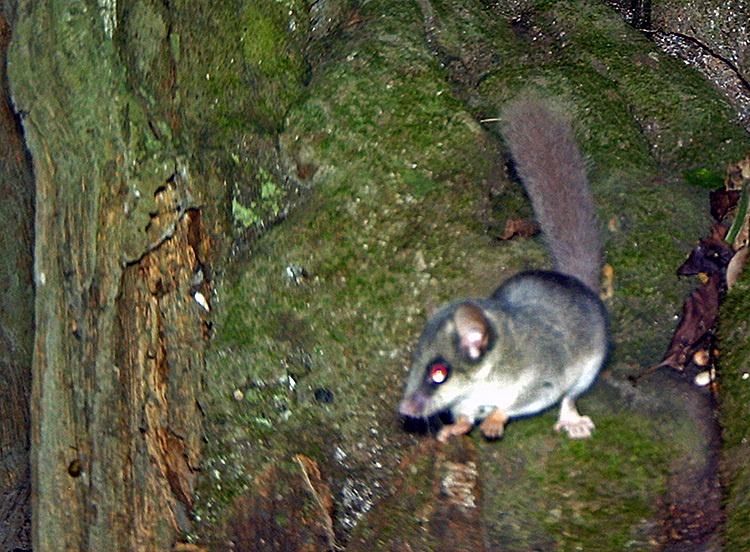 There was only one problem: Which species of Dormouse is this? 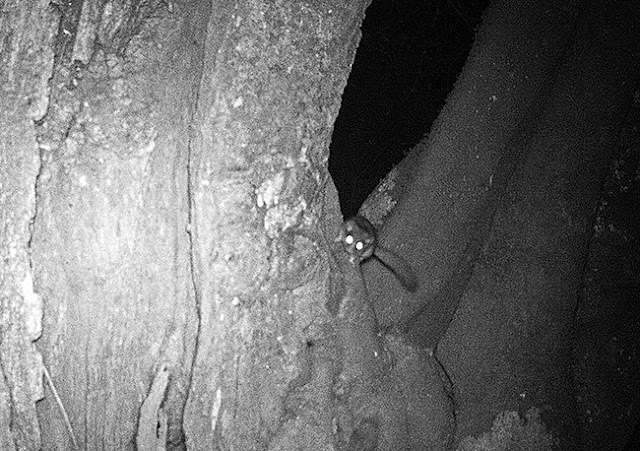 Although the infrared Bushnell Trophy Cams are great at capturing anything, big or small, passing by the camera the grainy grey night time photos aren't pretty and makes identifying most rodent species very difficult. Luckily, back home, it was around this time that I took the plunge and bought my first Birdcam. This was going to be it's first field test. I pointed it to the tree and hoped for the best. I still don't know what to make of this camera. 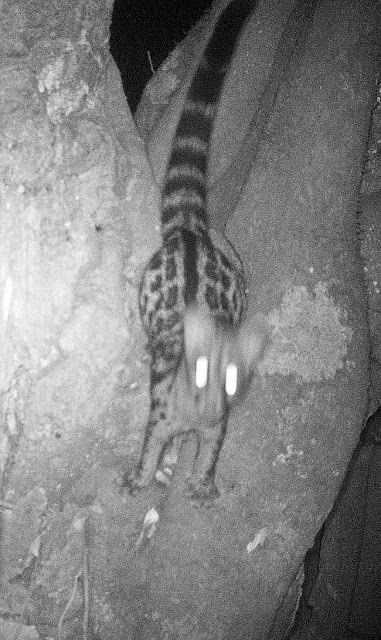 It seems to have a very good flash (for a commercial camera trap) that doesn't need to be dimmed even for very close shots. The strange thing is that it only has a manual focus. This allows it to take photographs of creatures very close to the camera. The problem is that if you have the setting wrong, or the animal isn't in the "sweet spot" then the animal will be out of focus. Thus the Birdcam can be set to focus much closer than normal commercial cameras. I'll keep you posted about this camera as I try it out in different situations, but my initial impression is that it is decent choice for some specialised camera setups. The camera had only one empty photograph, but in general it trigger far less often than the Bushnell did. 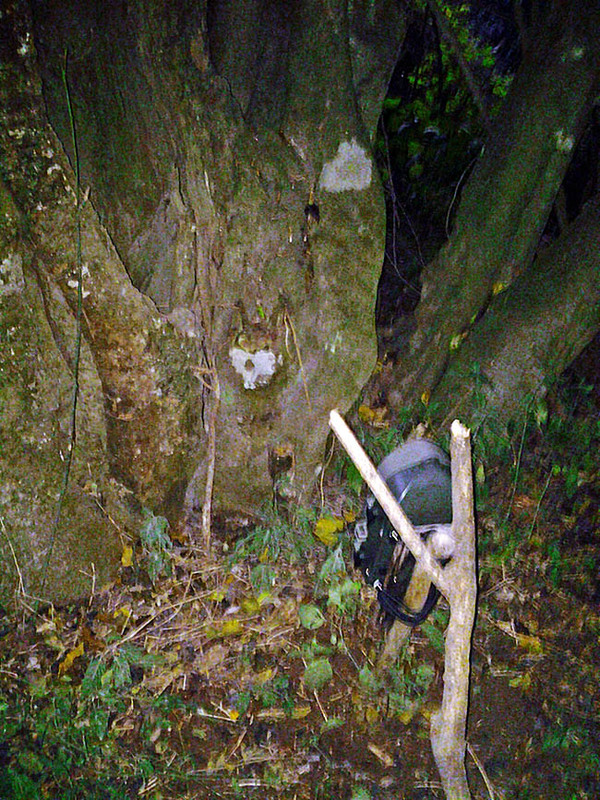 But then again the Bushnell covered a larger part of the tree and has an excellent detection circuit. Enough about the cameras, more about the animals! Is he practicing his ninja-chop? 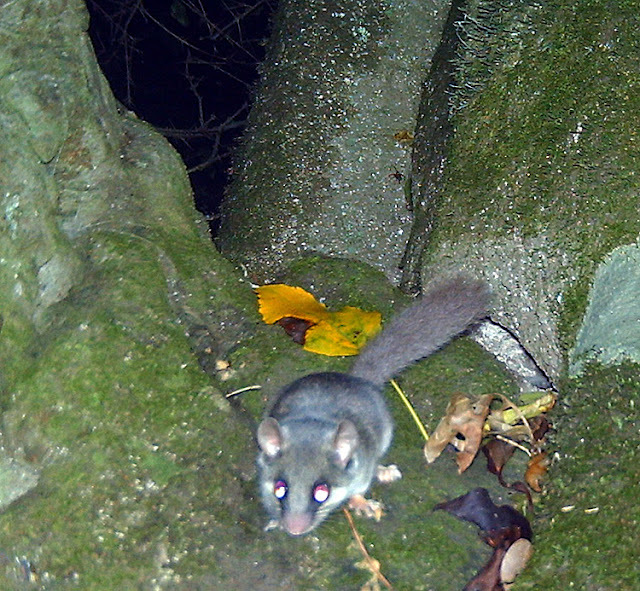 Woodland Dormice are rodents, however unlike most mice and rats they have very furry tails. 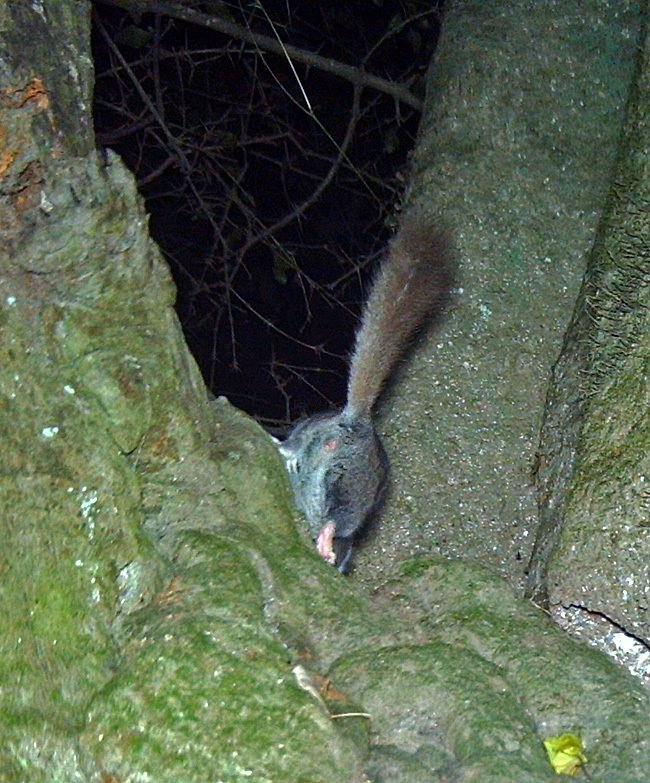 They nocturnal and very good climbers. They are often found in houses and can become fairly tame. They eat insects, fruit and seeds. They are known to hibernate during winter and go into torpor during food shortage or cold spells. 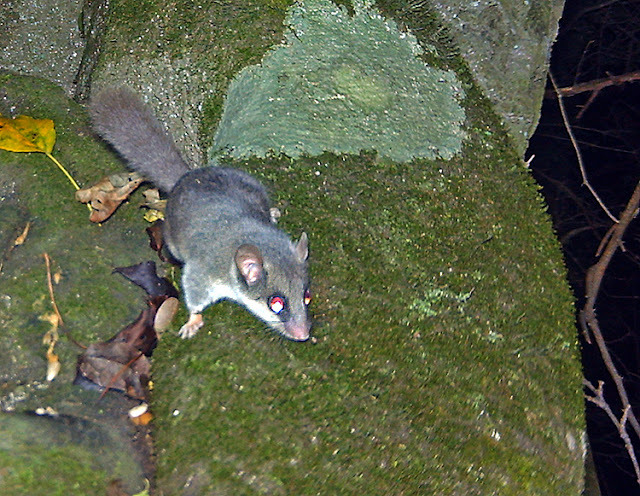 Dormice live alone or in family groups that may share a nest. Nests are built in trees or amongst rocks from grass, lichen, etc. Family groups defend their territory fiercely from other Dormouse intruders and will even kill and eat the intruder! These sweet looking little mice are more like fierce ninjas that will take over another families home, eating any family members that get in their way. What predator would be brave enough to prey on such a fierce little rodent? 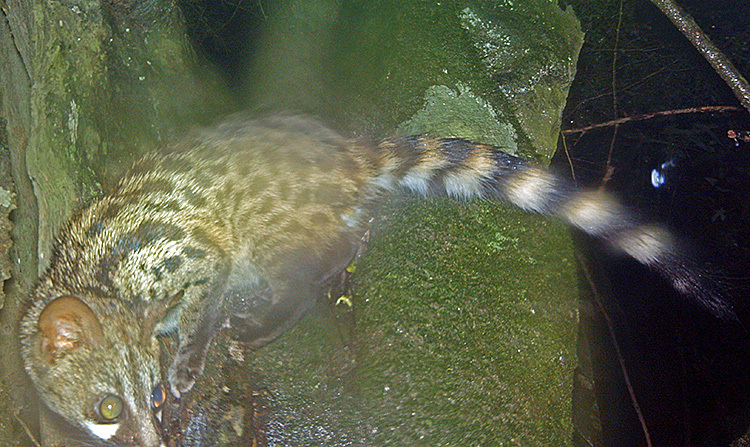 Well, I'd put my money on this guy: The Large-Spotted Genet. The Large-Spotted Genet payed a couple of visits to this Dormouse-highway. "Mmmm, I think I'm going to jump onto that box-like-thing. I'm sure nobody will mind..."
A more curious visitor was this Small Grey Mongoose that dropped by one day. The tree saw very little action during the day, so I have to wonder what this guy was thinking. Maybe, like me, he just wanted to have a look in the hole (you never know what might be down there). 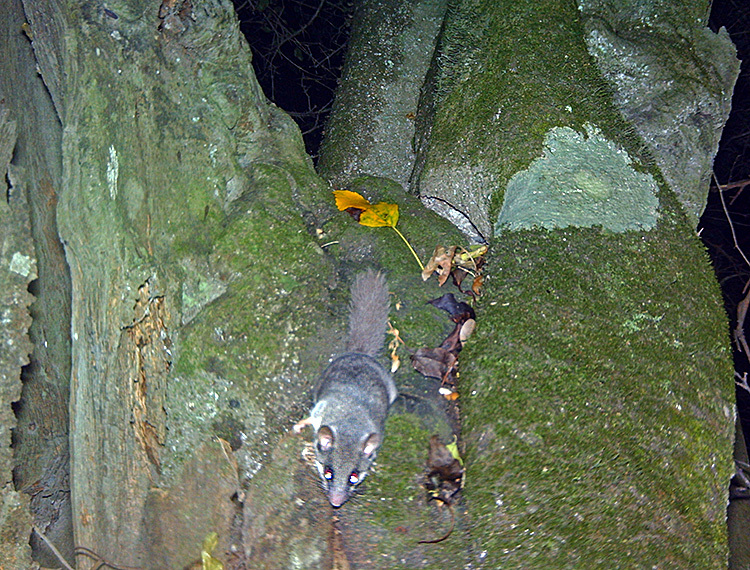 Maybe it was looking for some sleeping Dormouse to snack on? All in all this has been a fun location and I might revisit it some time in the future. And with that it is the end my the tail. Henri, you have a fascinating blog. This post was particularly interesting. I really love that first Genet photo. In fact, thanks for all of the comments you've left me over the years :) I always enjoy hearing from you, especially about your African adventures. Hey Henry. Very cool post! I'm interested to hear more of your thoughts on the Birdcam. I've not been very happy (in fact distinctly unhappy) with my recent experiences with Cuddeback and Scoutguard incandscent flash cameras. So I'm in the market for an alternative that can do decent colour close-ups of small mammals. What a terrific mouse. And a great job telling their story, Henri. As I think you've seen in my posts, I've found that nests like these can often be more interesting to set on than game trails, because they're focal points of activity by birds and mammals looking for the occupants, dropped seeds and fruits, or the insects and herps that also live inside. I.e., they're like a corner market. Also looking forward to hearing about and seeing your results from the Birdcam. I've recommended them a couple of times to people who want to do small mammals, but don't want to hack a homebrew. Thanks for the comments guys :) I'll keep you posted on how the BridCam turns out.